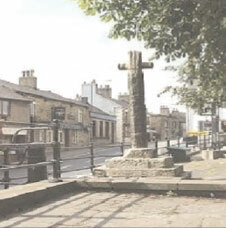 The Chapel-en-le-Frith Parish Neighbourhood Plan provides a vision for the future of the Parish. It sets out planning policies covering the 15-year period of the Plan from 2013 to 2028. These policies generally accord with both the Government’s planning policy and High Peak Borough Council’s developing Local Plan, as required by the Localism Act. When it is adopted, the Neighbourhood Plan will be the Planning Policy document and will form all planning and development in the Parish. Following well-attended consultation meetings and a wide-ranging survey, which was completed by over a quarter of the households in the Parish, the Neighbourhood Plan sets out objectives on key themes such as moving around, housing, employment and tourism, the countryside and Chapel-en-le-Frith town centre. A Neighbourhood Plan is only able to deal with issues of planning and land use, but in the course of Chapel Vision’s work a wide range of ideas was put forward to help improve our area and community for the benefit of everyone. Chapel Vision has carefully assessed what is needed and what local people want. Other important issues that are not related to planning or land use have not been forgotten but are the subject of the separate Community Plan. “Chapel-en-le-Frith Parish Council is very grateful for the enormous amount of effort put into the production of the Neighbourhood Plan by the members of Chapel Vision, to the hundreds of local people who attended consultation events to give their ideas, and also to nearly one thousand residents who completed the detailed survey, the results of which were used as a basis for the Plan. The Parish Council hopes that local people will continue to be involved in the projects and proposals that will help to make Chapel-en-le-Frith and the Parish area an even better place to live, work and enjoy. The geographical area of the Neighbourhood Plan is the same as that defined by the boundary of Chapel- en-le-Frith Parish, which is shown with a black boundary on the map in Figure 1 overleaf and which covers 37 square kilometres. 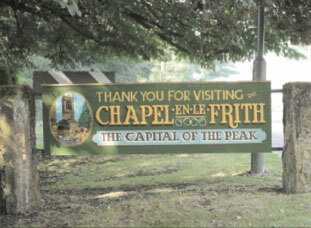 The Chapel-en-le-Frith Neighbourhood Area was established on 11 April 2013 further to a request by the Parish Council and formal confirmation by High Peak Borough Council. For the purpose of this document the term Neighbourhood Plan is used to refer to the Neighbourhood Development Plan. 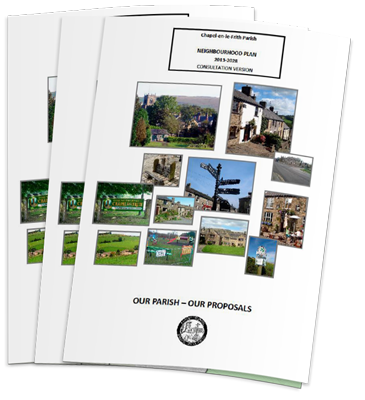 This is the final version of the Neighbourhood Development Plan and will be formerly submitted to High Peak Borough Council who will arrange a further public consultation and examination. The Neighbourhood Plan will be submitted for examination. The examination will be carried out by a suitably qualified Planning Inspector who will take views on the Neighbourhood Plan, examine the evidence on which the Plan is based and ensure it conforms to all legal requirements. If the Neighbourhood Plan is approved by the examiner it can proceed to a referendum. A public referendum will be held on whether the Neighbourhood Plan should be adopted. A simple majority in favour of those voting will allow the Neighbourhood Plan to be adopted and form the Planning Policy Document for Chapel-en-le-Frith Parish. 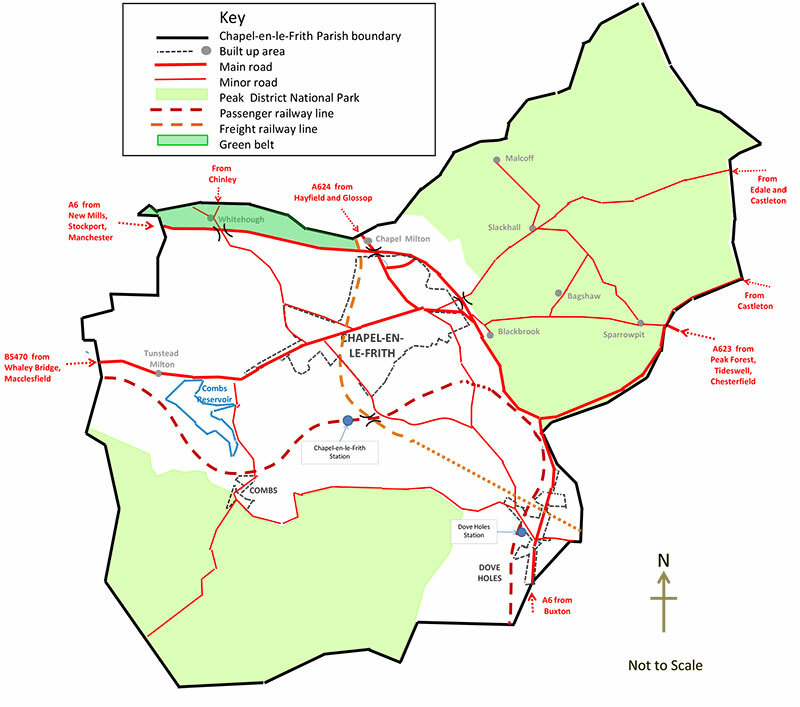 The Parish of Chapel-en-le-Frith is located in an area of North Derbyshire known as the ‘High Peak.’ Over half of it lies within the Peak District National Park. Chapel-en-le-Frith is a small historic town, set in beautiful countryside, and is known as ‘The Capital of the Peak.’ It is an important centre serving the surrounding area, including the important villages and hamlets of Dove Holes, Sparrowpit, Bagshaw, Tunstead Milton, Whitehough, and Combs. In 1225 the Earl of Derby gave permission for the foresters in the Royal Forest of the Peak to build a chapel in the forest (Chapel-en-le-Frith). The Chapel was built on a spur of land below Eccles Pike and the settlement that grew around it became a centre of government for the Royal Forest of the Peak and an important trading route between Cheshire and Yorkshire. A substantial Old Town survives at the core of Chapel-en-le-Frith and old stone houses cling to the hillside below the Parish Church and ancient Inns are clustered around the Market Place. A number of halls in the hills may have their origins in the first colonisation of the Royal Forest when ‘burgages’ were granted in return for services to the Crown. These include Bradshaw Hall with a fine Jacobean gateway, Bowden Hall bearing the family crest, Slack Hall on the path of the Castleton turnpike and Ford Hall in the shadow of South Head. Some of the deep lanes which criss-cross the hills are former drovers’ roads and trade routes marking Chape-len-le-Frith’s role as an important staging post in coaching days. Horse-drawn wagons carried stone from the quarries at Dove Holes and Peak Dale to the Peak Forest Canal at Bugsworth Basin, supplemented by an innovative gravitation railway which opened in 1796 – its remains are still visible today. Chapel-en-le- Frith contributed to the development of transport with the invention of brake blocks by Herbert Frood, who established the Ferodo Company in 1897. The company now trades as Federal Mogul Friction Products Ltd and provides friction materials for the automotive and railway industries. The ‘Bull Ring’ henge in Dove Holes is a scheduled ancient monument which dates back to the late Neolithic period and is a well preserved example of a Class II henge. Combs is one of a number of other hamlets in the Parish together with the communities of Blackbrook and Bagshaw tucked into the hills which rise up from the eastern end of Chapel-en-le-Frith. Sparrowpit is a linear high-level village and Whitehough is tucked in the hollow below Chinley Churn. There is a hall in the centre of the settlement which has the appearance of a late Elizabethan manor house. There are several schools in the parish: Chapel-en-le-Frith High School, Chapel-en-le-Frith Primary School, Dove Holes Primary School and Combs Infant School. There are also 63 shops, several public houses, hotels and guesthouses, a range of cafes and restaurants, a golf club, a cricket club and a football club. Scenes from the recent BBC TV series The Village and The Secret of Crickley Hall were filmed in and around the Parish, and a local Hall featured in both series.